Some of you have never been in an inverted position. Here is a quick 1 min. 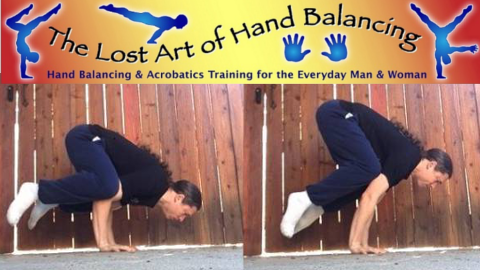 tip that you can use in order to get you balancing on your hands with a little support from a wall! 1. Face the wall and begin with a Sprinter Stance! Approximately 10 inches or a little less than a foot would be enough to give you enough head-clearance on your first attempt. 2. Make sure that that you drive with your rear leg and jump up with your lead leg! I usually use my stronger leg to drive from. You've successfully preformed your first Hand-Stand Lead Up Stunt! Be sure to watch the full video below to see the Kick Up Wall Handstand in action! Hypermonkey Holiday Handstand Jam 2015!